As we stated at the beginning, real Christian ministry is a privilege to bear a cross for Christ, not an opportunity to be successful or popular. This principle is very real to me since I had no aspirations other than to just be faithful and obedient to God. My insecurities limited my scope of ministry. Yet God’s solution for delivering me from this timidity (this self-focus) was to cause me to step into the greater responsibility of leading a ministry, and one with horrendous problems. God knew stepping into this battle would be enough to break me. This is where we learn that God will sometimes call us to do what seems to be diametrically opposite to what is comfortable or natural to us. A powerful illustration and shadow of this spiritual principle is found in 1 Samuel chapters 5 and 6. 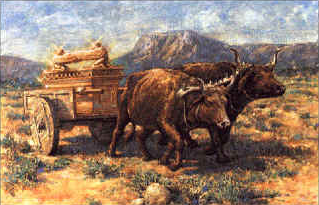 In the text we see that the Philistines had captured the Ark of the Covenant (the chest containing the Ten Commandments). 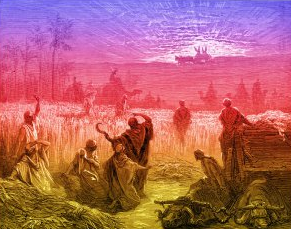 The ark of God represented the direct presence and glory of God; to have it meant you had God’s presence and ultimately His favor. The Philistines put the ark in their temple before Dagon, a Philistine idol. However, by morning when they arose, their statue was knocked over on its face. The next day it happened again, but this time its head and hands were broken off and the inhabitants of the city began to experience tumors and plagues as God’s judgments fell on the city. Here we see the “anointing” (the presence of God) cause two milk (mother) cows to go against the strongest natural instinct known on the planet, which is, the instinct for a mother animal to feed and protect her offspring. What possible force could have squelched this powerful natural desire of these cows to not respond to the cries of their babies? It was the presence and purposes of God. The Bible says that these cows headed straight for Beth Shemesh “lowing as they went”, and did not turn to the right or the left. These cows were also symbolically experiencing the sufferings of Christ as all believers do when they submit to the call of God on their lives. This is where many believers miss out on their purpose in life. Some of what God has called us to may require us to do certain things that are the opposite of what is natural or instinctive to us. The skill of these cows to pull a cart is being employed; but to go away from their very own offspring required a death of their very souls. The unction of God can steer us down a road that will “over-ride” our strongest fears and insecurities and even the unhealthy soul ties in our lives. Some Christians shrink back from the call of God because they can’t imagine God requiring this much of a commitment. Many believers would rather serve God out of their natural abilities and common sense because they have more control. Yet there is a place where we die at a deep instinctual level that qualifies us for an anointing that is a quantum leap from our usual service. When the Lord called us to deny ourselves and take up our cross (our calling) and follow Him, He knew the call would kill our flesh-nature and liberate us to fully serve Him as well as fully experience His resurrection life. (see Offering Skills versus Your Soul the Lord). I believe God has a deeper call on many Christians. They may be serving God faithfully the best they know how, yet there is more. The thing the Lord calls us to may be the weakest area of our life, the place where we are most insecure and fearful. However it is here where there is so little of ourselves to get in the way of how God wants to flow through us. Here is where we go from the place of self-sacrifice, where we give God our works, to the place of sacrifice of self He desires, where we have nothing to say about the matter. We simply obey the “unction” of the Lord and go down the road to Beth Shemesh! This is consistent with the principle found in Exodus 20:25 where it states: (see Self-Sacrifice and Sacrifice of Self). Always carrying about in the body the dying of the Lord Jesus, that the life of Jesus may also be manifested in our body. For we who live are always delivered to death for Jesus’ sake, that the life of Jesus also may be manifested in our mortal flesh. As we yield to the call of God on our lives, we will be amazed at how the Spirit of the Lord will lead us to do things that we would never do in ourselves. Yes, if the anointing of God can silence the cries of baby calves in the minds of their mothers, it can also silence the needy voices trying to deter us from our destiny as well. Posted in Most Popular Articles and tagged Anointing, Brokeness, Calling, Discipleship, Jeff Krall, Ministry on June 18, 2013 by Jeff Krall. ← Organization VS Organism – What is the Church?